iSTEP 2011 is complete! The internship wrapped up on Friday, July 29. The iSTEP 2011 team would like to thank all of our followers, partners, advisors and sponsors for “Following the Journey” with us this summer. 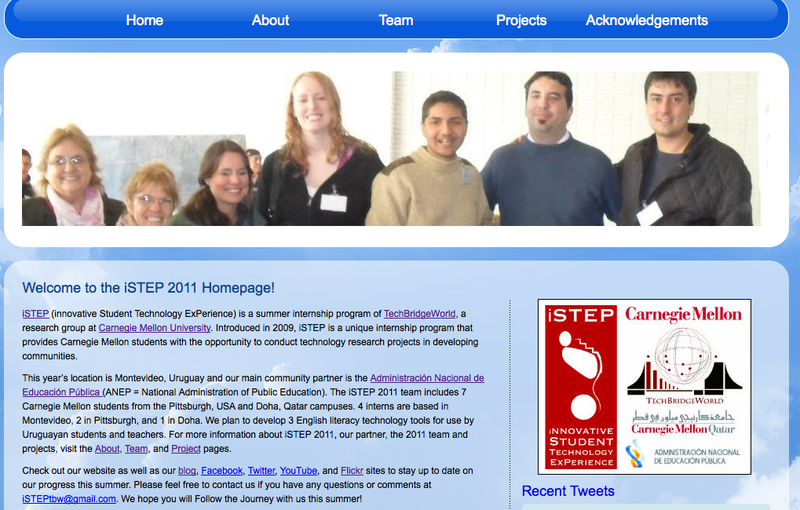 Please check the iSTEP 2011 website for internship outcomes and final report. Be sure to check the iSTEP program website for more information on future iSTEP internships. I would like to share my final reflection and lessons learned during the ten weeks of the internship while being in Doha and working with team members in Pittsburgh and Montevideo. Time management and communication was one of the most important lessons that I learned during this experience. The time difference between the three countries was one of the challenges that I faced as I had to maintain a good level of communication with team members to work with them on some tasks. Also, as part of my role I was involved in various tasks and working with different team members and I had to prioritize tasks and get them done on time. Freddie was helping me on that as I used to meet him weekly and update him on what I did and request his help if I faced any problem. In addition, I learned new technical and design skills and applied them to my work on the projects and website. I believe this experience was different than previous ones I’ve had. While I have worked on similar projects before what made this experience unique was that it involved a globally distributed team and ICTD field work. After being in Uruguay and working with through the iSTEP internship experience, I have learned that you always have to be prepared with a back-up plan. This applied to multiple areas of my work this summer. I thought I would have a couple weeks longer for development but did not due to a much longer than anticipated needs assessment. This required quick thinking to develop a plan for the creation of the OCT. I also needed to have a back up plan when I was switched from the CAT to the OCT project. Again, I needed to use a plan to make this switch as smooth as possible. In field work, you always need another plan! What have I learned this summer? system is implemented, such as Plan Ceibal. positive and confident people at that age are about the future. The main lesson that I will be taking with me this summer is the importance of building and maintaining relationships. Philosophically, I have long held the belief that what matters most in life are the relationships we build, but now I have seen that professionally the same holds true. To my delight, this was reinforced by one of our partners on the ground who states that “the human connection has lead to the success of the projects.” While I have known that relationships depend on what we give of ourselves, it was never more evident that through this internship. Throughout this internship I saw both extremes and I truly believe that the outcomes reflect this. I will take with me the life lesson that reciprocity is not only something that exists in the personal realm, but also in the professional. Thus, I will never forget the passion and enthusiasm that all of our partners on the ground have showed and the open hearts and minds that they welcomed us with. Another wonderful lesson that I have iSTEP 2011 to thank for is how truly diverse working cultures can be. It was fascinating to be caught right in the middle of two wholly different working cultures. ‘Globally dispersed’ has taken on a whole new meaning. On the one hand we had hard deadlines and meetings that started no more than three minutes after they had been designated. On the other we had lax meetings where people trickled in to meetings as they were able to make it and personal topics would naturally arise. Another example is sometimes we had multiple meetings in a row leaving no time in between to talk, while at others, team members would linger and talk about nothing in particular. This was truly a one of a kind experience that only an internship like iSTEP could offer. Lastly, I have learned the importance of being selective. I learned this lesson not only through my own experience, but also through my colleagues’ and our partners’. As my brother in law has often repeated “Haste produces waste” and I found that this is a very practical lesson to apply to technology as well as personally. Before coming to CMU, I had worked for a company based in San Diego while I was in Morocco. That experience helped me picture how geographically distributed teams work and appreciate the importance of keeping communication lines open despite connectivity problems. Being considerate of other people’s time and willingly adjust to their work schedule also proved to be very crucial while dealing with iSTEP interns in Uruguay and Doha. Having worked with each other since January, I got used to receiving emails at 5am Pittsburgh time from Asma or sending her an email at night and having to wait till the next day to get an answer. It’s all about adjusting and I think that everyone did a terrific job at that. One of the things I am most proud of is the relationship I developed with my team members. Skype conversations were a great way to stay in touch and learn more about everyone’s routine. Also, reading everyone’s blog and seeing the iSTEP experience through their eyes was something I enjoyed doing and always looked forward to. Everyone had to be informed about what was happening in the three locations and our weekly meetings often had a fun component at the end like learning about how some team members went salsa dancing or how others enjoyed their time at home or in CMU campuses. We all had to be attentive, responsive and sometimes willing to compromise on meeting times or submission dates to accommodate our fellow teammates. After seeing the great overlap between the iSTEP 2011 CAT and the iSTEP 2010 English Literacy Tool, I had decided after consulting with the team to develop the current tool based on the old one. It made a lot of sense not to reinvent the wheel especially that the tool in hand was developed with great care and attention by last year’s interns. In was all great until somehow I lost sight of the big picture as it seemed that I was not developing anything from scratch. Being an information systems student, we are taught to reuse existing tools but to also take pride in developing our own. Those moments of doubts did not last long. While developing from point zero would have been great, time and resources available were not enough. The choice of utilizing something that is functional was actually a good one and will hopefully help us reach our goals of providing the community with reliable tools in the timeframe and within the resources we were given. Seeing the bigger picture and how the projects can contribute to improving the community is a life lesson that I will always cherish and that I got to experience firsthand thanks to the iSTEP internship. Social Media, iSTEP, and Pittsburgh! Over the past 10-weeks I have learned a lot about working in a multi-disciplinary, globally distributed team. I have also learned a lot more about marketing and organizing report writings. Plus, I’ve also gotten the chance to have fun in Pittsburgh! A couple of the top things I have learned include: 1) using social media 2) writing professionally and 3) setting firm deadlines. Social media is a team effort and to make all of our success possible, everyone on the team contributed (such as with the blog!). This, and our other sites helped us get featured elsewhere, including the Pittsburgh Business Times, in the One Laptop Per Child blog, and on different CMU sites (like SCS, Robotics Institute, CMU-Q, and CMU!). I really like seeing all the publicity and recognition our hard work has gotten us and hope that it continues! Pittsburgh has been awesome this summer. Staying here I have seen some of the amazing things the Burgh has to offer. Going to the Science Center, seeing the midnight Harry Potter show, and going to a casting call for “Magnus Rex” – the code name for a movie being filmed here – were all a lot of fun. Plus I’ve been able to meet up with some students from our Doha campus taking classes this summer! You never not what the day is going to hold and its been so much fun to have the chance to explore and enjoy the city. The iSTEP internship program was truly a unique opportunity and a great chance to learn a lot. I am very thankful to have had this experience and am encouraged by the work that we have accomplished. I hope that the tools the team has developed will have an impact on learning and teaching English in Uruguay.